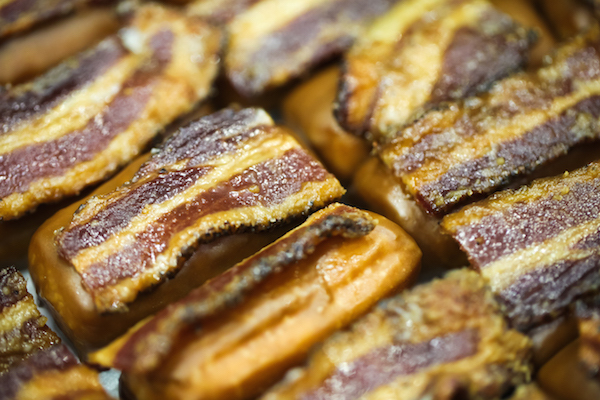 Save the Date – Baconfest 2016 is Coming! Baconfest Chicago 2016 will be held on Saturday April 30 and Sunday May 1, 2016 at the UIC FORUM (725 West Roosevelt). Want tickets? Our annual holiday presale will go live at noon on Monday, December 7. For the very first time, we’re offering early bird pricing for bacon fanatics who are ready to commit to bacon-paradise AND we’re making a limited number of early bird General Admission tickets available in addition to Early Bird VIP tickets. Early Bird VIP tickets will cost $175 plus fees; Early Bird General Admission tickets will be $75 plus fees. Once the limited inventory of Early Bird tickets have sold out, VIP tickets will return to $200 each. General Admission tickets won’t be available again until our main ticket release in Mid February, when pricing will return to $100 each. Tickets will be available through this website and through our Facebook fan page. New this year, we’re adding a layer of fun to each session with themes and featured cocktail pairings. 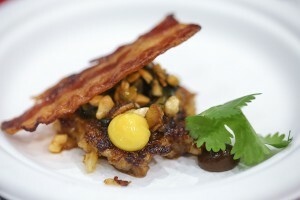 We’ll add a Golden Rasher award to the line-up to honor restaurants whose dishes express the session theme. Like last year, we are planning to explode Baconfest Chicago beyond the borders of that two day period into what we call “BACON MONTH CHICAGO” with a full month of preview events around town. If you are a bacon fan in Chicagoland, by now you know us. You know the event ROCKS. You know we’ll do everything in our power to make sure you have a great experience with our amazing chefs, sponsors, and other exhibitors as we gather together to celebrate bacon. You know we support an incredible charity partner, the Greater Chicago Food Depository, for whom you’ve helped us raise over $300,000 since we began. We hope you know what a pleasure it would be for Baconfest to have you return to party with us once again. For anyone not familiar with our event, please join our mailing list and follow us on Facebook and Twitter so that you can stay tuned for details about next April’s mega-bacon-spectacular. Check out our wrap-up of last year’s event. 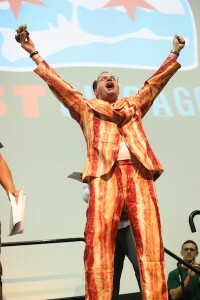 ←Who will be at Baconfest? When can I buy tickets?